With the purpose of establishing a center for research as well as building up research schemes, I carried out the following activities. In Botswana, I visited Dr. Keitseope Nthomang, who is involved in the Programme for San/Basarwa Research and Capacity Building. I was given an explanation of the programme and discussed possible future collaboration through research. I also filed an application to extend the Research Permit. In Namibia, I visited researchers such as Professor Wilfred Haacke of the University of Namibia and Dr. Thomas Widlok from the University of Heidelberg, to exchange information regarding anthropological researches in Northern Namibia, and then talked about future collaboration through research. I also met with Mr. Yuichiro Fujioka, an ASAFAS graduate student (year of enrollment: 2002), who has been doing research on changes of vegetation and tree utilization by the Owambo agro-pastoralists, and discussed the results and future plans of his research. I also collected documents on people's organizations among the San (at the University of Namibia), did documentary research on the historical relationship between the San and missionaries (in Oniipa, Northern Namibia), and investigated San development projects (in Ekoka village, Northern Namibia). (1) In Northern Namibia, various cultures have intersected and thereby created the history of the area. In this context, interdisciplinary research can be particularly effective. Carrying out integrated research with the collaboration of wider disciplines and perspectives remains an issue for the future. (2) In Botswana, I focused on carrying out the procedures to extend the Research Permit and thus did not have sufficient time to exchange information with local researchers. Although we have initiated academic interactions with the University of Botswana, the task remains to construct a framework for further collaboration that accords with the goals of the COE programme. 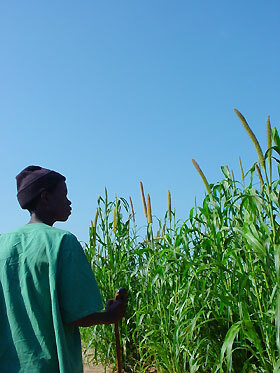 A San man looks at Pearl millet in an agricultural field, where the development project of San is being carried out (in Ekoka village).